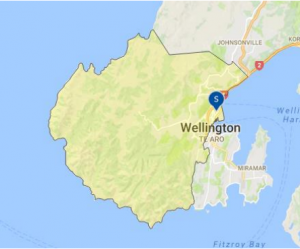 All students who live at an address within the home zone described below (and shown on the map) shall be entitled to enrol at Wellington Girls’ College. The Wellington Girls’ College zone includes all address in the city side of Brooklyn (not Kingston), Kelburn, Northland, Wilton, Wadestown, Chartwell, Crofton Downs, Ngaio, Karori and Khandallah (not Broadmeadows). In the city itself are the areas of Aro Valley and Thorndon and streets west of Willis Street. The boundary of the zone shall be a line extending from the Ngauranga Railway Station northwest to the junction of Fraser Avenue and Burma Road, then south along Burma Road (including house numbers 75 –103) to Kim Street. The boundary then continues northwest across Khandallah Park to Mount Kaukau, and bisects at 591 Takarau Gorge Road to Smiths’ Bay. Takarau Gorge Road numbers from and including 591 are in zone. Kim Street and Kimberly Way are in zone. Fraser Avenue and all streets off it are out of zone. junction of Bidwill Street. After this junction all house numbers on Brooklyn Road are in zone. Liardet Street numbers 1 to 17 are in zone. Krull Street numbers 4 to 16 and 22 to 30 are in zone. McColl Street is out of zone. meets with Mornington Road, and then to the junction of Mornington Road with Clarence Street. Mills Road numbers south of and including 36 and 37 are not in zone. Clarence Street is in zone. Mornington Road numbers up to and including 80 are in zone. Parade and finally west along the northern side of Owhiro Bay Parade to the end of the road. Borlase Street is in zone. Stock Street is out of zone.